Need a rehearsal space or multimedia equipment? If we have the resources, we are willing to share. Please contact the office for rental information. Sosa Carrillo Fremont House rooms and courtyard for rent. 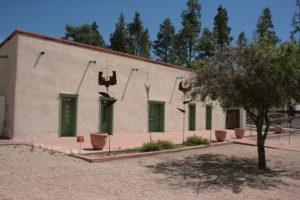 The Sosa Carrillo Fremont House is the new home for Borderlands Theater and is quite accessible to downtown and just a jump off Interstate 10. In the House is a museum, in which some rooms are able to be rented on a one time or ongoing basis. The building is wheelchair accessible. Non-profits receive a 10% discount. 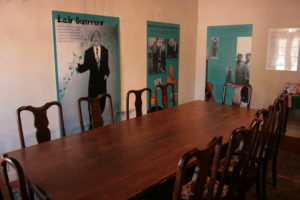 The Rehearsal Hall comes with 16 comfortable chairs and is 10 ½’ x 32’. This is a great space for theater groups to rehearse their next big show!! 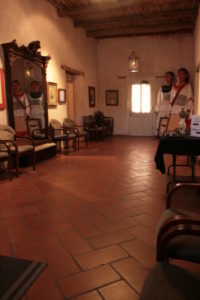 The rental price for this space is $25.00 an hour or $175.00 per day. Courtyard with Kitchen accessibility==The Courtyard 27’ x 83’, including a patio where you could set up a buffet. Easy access to the kitchen where you are welcome to use the refrigerator, coffee maker and sink. 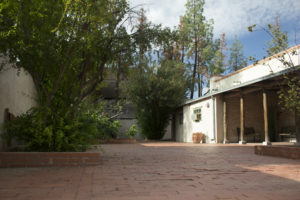 The Courtyard rents for $75.00 hr or $550.00 for the day. 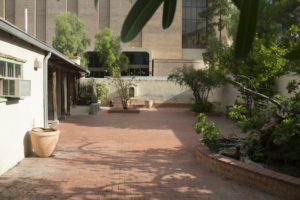 The courtyard also has a driveway for easier loading/ unloading. 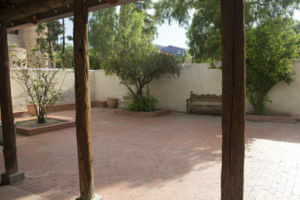 Also available is the option to rent the whole space, including the conference room, rehearsal hall, kitchen and courtyard for $750.00 a day. We also have wi-fi in the house.